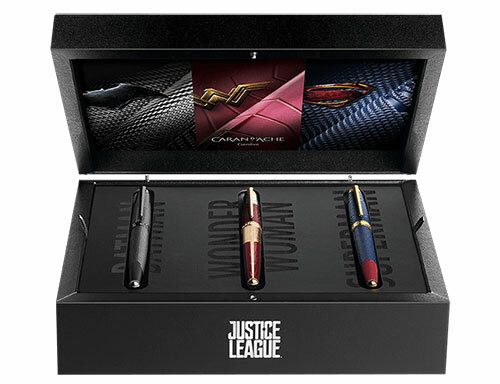 With its new Justice League Trinity special edition, Caran d�Ache brings together three legendary superheroes, Batman, Superman and Wonder Woman, and designs remarkable writing instruments to honor their unique characters. The details of each writing instrument are inspired by its superhero*s powers and iconic costume in a combination of rich, colored lacquers, deep-cut engravings and precious metals. The skilled craftsmen of the Geneva-based company combined their expertise to overcome technical challenges and innovate new techniques to create the various engraved costume textures and elements. Batman features a black ceramic coating with black PVD-plated accents; Superman is finished in blue and red lacquer with 14kt yellow gold trim; Wonder Woman has burgundy lacquer with metal elements plated in silver and rose gold. Reveal your own super writing power with the Justice League Trinity fountain pen with 18kt gold nib and capped rollerball models. Cartridge/converter fill, with the converter included.